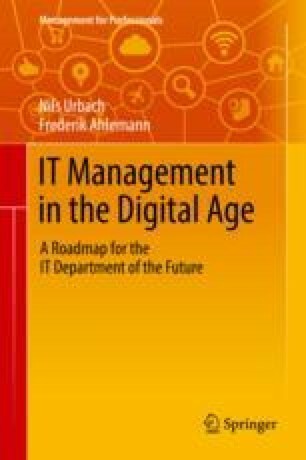 In the previous chapters, we described—in detail—the challenges and implications of the digital transformation and outlined our expectations and recommendations regarding the future structure of the IT department. An aspect that has been neglected thus far, is the employee’s role in digital change. Exactly as in the past, transformations in the corporate context cannot be mastered without the right and, above all, properly trained employees. However, the trend towards digitalization particularly requires qualifications and skills that are rare in the current labor market. Moreover, the digital working environment is, in many cases, only conditionally compatible with the conservative and hierarchically organized environment of large corporations. Even though the upcoming “war for talents” was forecast and discussed several years ago , access to good employees seems to have become a strategic competitive factor at present. More and more “traditional” companies find it difficult to identify new and retain existing employees, especially those with the necessary “digital skills,” for example in IT development or data analysis. For many young career starters, large IT companies, such as Google or Microsoft, or the small, dynamic start-ups are more attractive. There are various reasons for the current personnel-related challenges that companies face. In the following, we will get to the bottom of these causes: first with regard to the demographic and labor market development (macro-perspective) and then with regard to the employees’ development (micro-perspective).